This is the moment when it all clicks. I’ve been playing Elder Scrolls Online all day, and I like it. A lot. It’s a fast paced, well thought out, friendly and impressive MMO game. An MMO game set inside the Elder Scrolls universe. But there’s something missing. A spark. Zenimax Online Studio’s creative director Paul Stage is on-stage, and he wants to pull a Steve Jobs style surprise. The film starts. It’s a proper, integrated, complete first-person mode, straight out of Oblivion or Skyrim. Your weapons are wielded in your left and right hands. Spells fire from your finger-tips. When you block, any attacks ping of the swords or shields that protect your field of view. There is a palpable, audible reaction from the other journalists. 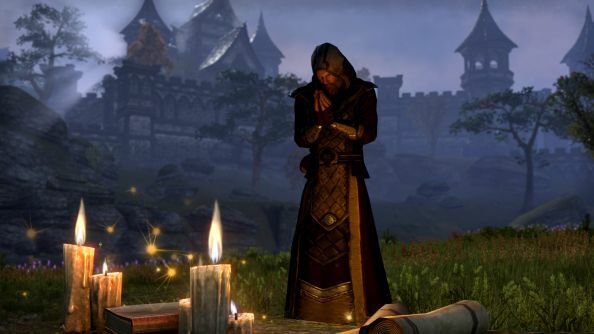 Elder Scrolls Online is no longer an MMO set in the Elder Scrolls universe. It is The Elder Scrolls, but Online. ESO has been flying a little under the radar for sometime. Partly, there’s a level of MMO fatigue amongst PC gamers. There’s also a question mark. How can primarily single player RPGs like Skyrim and Oblivion, games that are ludicrously orientated around making one single hero feel powerful, survive loot grinds and LFG chat channels and raiding and everything else that comes with an MMO. Here’s a good answer: incredibly well. And by charting a very careful course between Skyrim and World of Warcraft. To start with, Elder Scrolls Online is a single player RPG in which other players happen to be around. It’s heavily story focused, with zones that have a clear story-arc and progression. More: the combat system and dynamics of the Elder Scrolls games are almost entirely intact. Crouching puts you into a stealth mode, in which you can sneak past patrols. Combat is driven in exactly the same way: there’s no auto attack, and you click to swing. Holding the left button will result in a heavy swing. Holding the right mouse button will block: pressing the left mouse button while holding the right results in a shield bash that can interrupt and daze an enemy. Archery is archery: although your arrows will bend to hit their target as long as you’re mostly aiming true. Attacks and spells can be dodged by rolling out of the way. Character progression and specialisation is remarkably open: you’re able to wield any weapon via any class, and also wear any type of armour. Each class has three unique skill trees with abilities that unlock as you level. These abilities are a mix of passive and active spells, from which you can wield six at any one time: five normal spells and one ultimate. The goal, says Paul, is to get away from the rotation based combat that plagues the current generation of MMOs. In practice, it’s Skyrim with a far better interface – a first or third person RPG with the accessibility and instant appeal of Diablo III. If you’re playing in a group of two or three in the open world, it’s spammy, sure. But if you’re alone, out in the wilderness, you have to take care – choosing your attack timing and interrupting spells with barges. Combat has depth, too. Abilities will level up, and eventually fork: you’re able to morph them into a specialisation relatively quickly after you earn them. Fireballs that start off as simple balls of molten plasma may be complimented then deliver damage over time, or add a stun. A fast active spear skill may be complimented with a knock back. It’s made fun by some seriously smart quest design. In the two zones I played, both didn’t bother with the Christmas tree quest hub structure of World of Warcraft – where you enter a new town and discover four or five quests – complete those – and then move to the next area. Instead, it was closer to travelling and exploring. In Betnikh, the second zone I played, players are gently pushed North as they arrive on shore, with quests and objectives dotted carefully in the misty hills. The markers appear as glowing gold dots on the map, but you’re free to pick and choose the order in which they’re taken. There is progression, but it’s hidden well. But it’s the quest design that I found quite shocking. It is as close to a single player RPG that I’ve ever seen a game get. Closer than Star Wars: The Old Republic. Standouts included a trip back in time where I was asked to question the final remnants of a defeated army. When they refused to cooperate I asked my personal executioner to cut their throats so I could interrogate their shackled ghosts. Or, rescuing a Han Solo style smuggler and thief from a desert dungeon. Very little combat, but a deadly series of hidden flame and spike traps to traverse before unlocking his cell. In the four hours I played, I didn’t come across a fetch quest, and the only ‘collect 10 items’ style quest was over in less than a minute and a half. Solo players get a decent shot at great end-game loot, too. 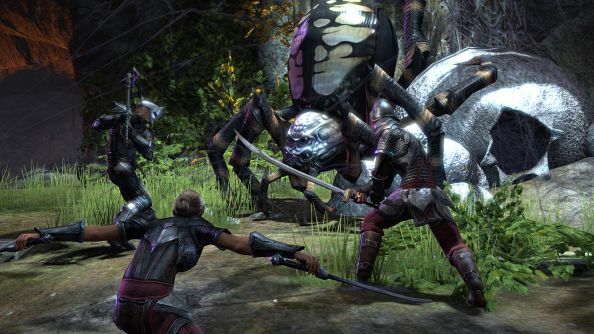 Elder Scrolls Online players will be split into three factions. Reaching the level cap (of 50) in one faction will take around 50 hours. But when you do, that’s not the end of your levelling. You’re then granted access to play through the other two faction’s levelling zones as a kind of Game+ hard mode. Those areas will be specifically instanced to only allow players of the same faction to interact. And when you’re done there, there’s the last faction to complete: as a Game++ hard mode. The loot available, say Zenimax Online Studios, should be equivalent to that available at end-game. The other end-game activity Zenimax are prepared to talk about is the game’s ambitious competitive mode. It’s World PvP essentially. There’s one map, and it’s big: Cyrodiil. As in, the Cyrodiil from Elder Scrolls: Oblivion, re-imagined as a vast battleground. It will retain the same cities and landmarks that you’ll remember from Oblivion, but now dotted by keeps and towers that players can work together to siege and capture. As we watched, groups of 20+ testers fired ballistas and catapults at the walls of a keep, shattering the brick-face, before bringing a battering rod to the front gate to smash it down. It is Warhammer Online, via Dark Age of Camelot, again. 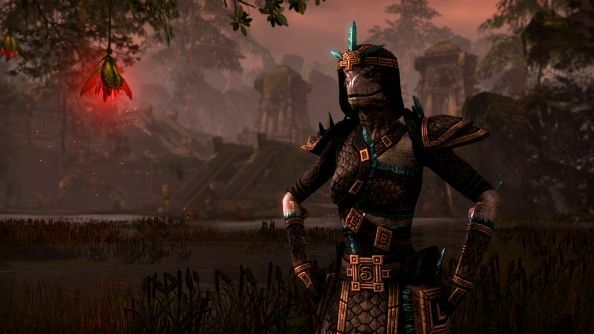 At the start of his introduction to the Elder Scrolls Online, game director Matt Firor explained how the team reached the design they have in mind. He talked about how their game has to appeal to “both MMO players and Elder Scrolls players”. It’s not enough to make a game for one or the other. It has to be a game for both. I was skeptical of the Elder Scrolls Online. Zenimax Online Studios are a new studio, although filled with veterans from the MMO business. This is Bethesda’s first MMO. The game series they’re building on from is notoriously single player centric. Yet, somehow, they’ve only gone and done it. It’s going to work. 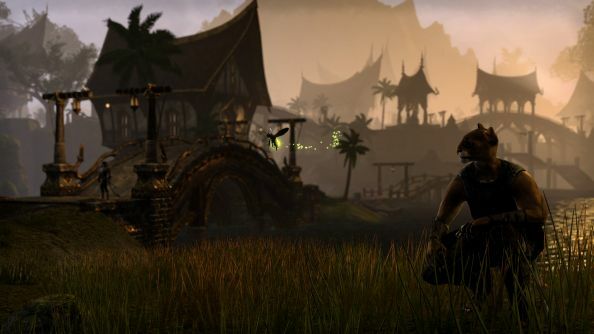 The Elder Scrolls Online remains in development, but we’ll expect it to be released this year. You should sign up to the beta. It’s good.